One final round to go and this saw Matilda and Faith up. Both nursing injuries (knee & ankle plus recovery from broken knuckle) they had made the decision to fight through. Matilda nailed her floor and finished with a grin. Faith had been struggling with the free cartwheel in warm up and those sneaky hands went to the floor. Unfortunately this threw Faith who had an out of character moment and forgot her spin. A costly mistake and a frustration to Faith who was now carrying a penalty on a strong move. At this point their competition experience came to the fore. Together with coach they worked out what was needed to pull this back and headed off to range knowing strengths, weaknesses and with renewed determination. Matilda was on her strong pieces and delivered the scores she knew she could, an excellent 12.650 on range and a whopping 13.1 (7th) on vault. Faith knew range and vault were not her strong areas, kept her head and made pragmatic decisions. Pushing through on range and only doing one vault to secure solid scores and save energy for her stronger scoring pieces, bars and beam. Faith nailed her bars with style and showed what she was made of. It was now Faith’s turn to cheer Matilda through her tough moves. A bit of high speed coach swapping saw Mrs Nobbs stand in for Matilda’s giants, the first of which went swimmingly. A hit on the low bar got in the way of the second and a fall followed. Matilda and Mrs Nobbs got her straight back up for her dismount and Matilda still secured a solid 10. Still determined and focussed it was off to beam. Matilda secured that front walkover in warm up, unfortunately in the actual routine she landed it, but off balance. She fought incredibly hard to stay on covering a quarter of the beam to try and regain balance, but it just wasn’t possible. Not going to let that stop her she was back up with a grim and focussed look to regain every point she could. Faith knew that the recovery to a pass was in reach if she could deliver the beam she knew she could. So that’s what she did. Front walkover, flic, leaps, all landed with the resounding thud of someone securely landing on the beam. Faith and Matilda breathed, although disappointed with certain moments they both had that calm resolution that they had fought hard and knew that they should have done enough to secure a pass. Resigned to this but proud of their determination they went to line up. When called out for their commendations the combination of shock, disbelief and true delight was a pleasure for the coaches to see. They hadn’t just pulled back a pass but had fought so hard that they had just managed to break the magical 55 barrier and average 11 on every piece. It had been a journey for gymnasts and coaches alike! It was a tough weekend for the coaching team, with Nichola coaching and judging, Mrs Nobbs covering Yorkshire, keeping huge competitions on time and stepping in whenever needed, Sharon coaching and also doing some Yorkshire duties in the gaps. The coaches had to chop and swap but with teamwork and with the support of both gymnasts and parents it was possible. A special mention needs to be given to Nichola who kept the calm overview, made sure everyone was where they needed to be when they needed to be there and if they couldn’t be there stepped in, as well as doing ALL the driving to keep everyone fresh and focussed. A special mention and thanks to the parents who worked so hard on set up, a thank you to the many committee members who proactively looked for where to help manage that set up and caught potential hiccups before they even happened. A particular thank you to our Vice Chair Rebecca who would not leave the venue on Friday until she knew the Wetherby coaches were sorted for the morning and kept a watchful and supportive eye on everybody through out the weekend. It was a weekend when we fully appreciated how much Eva does to keep us sorted and to manage it all through. It took the whole team to cover her absence! She was sorely missed, but we did it! 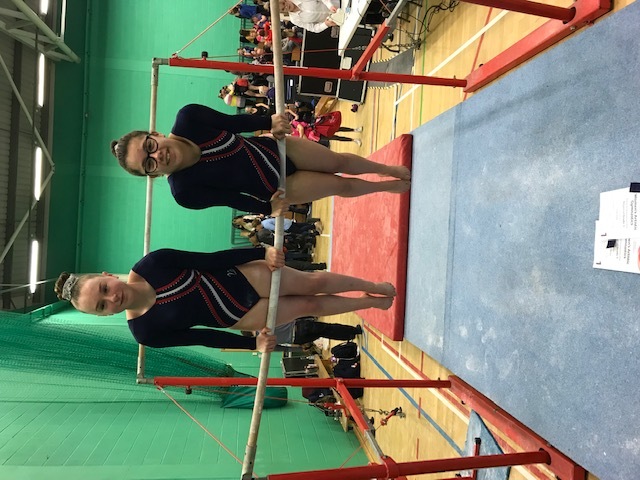 The results were good and something Wetherby and the gymnasts should always be proud of …… the club spirit was fantastic and should always be remembered. Round 4 saw our senior Bailey in the frame. Ellie had the unenviable task of going round on her own, but that wasn’t going to stop her. 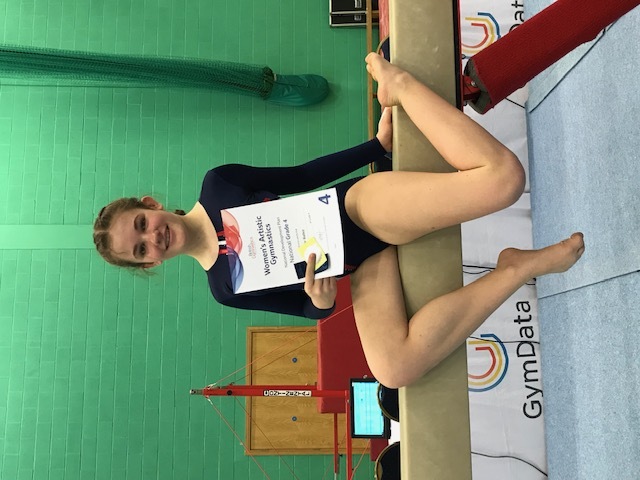 Stepping up to National grades, she competed in a very strong field and a large competition of 51 gymnasts. She started on floor, performing her routine with that Bailey flair! She missed a top 10 position on floor by a mere 0.05 and delivered the 7th highest score on this piece. A superb achievement for a new routine in a National grade. Despite not getting a couple of holds on range she ploughed forwards to still achieve 11.7. Vault flew to a fantastic 12.550. Then to the dreaded bars. There was no stopping this gymnast, having struggled a little with the giants in the gym, she knew how much warm up she needed and exactly where to find that extra something. Ellie was going to get those giants round from her cast come what may. A slight stall at the top saw this gymnast use everything she could to bring those giants down the right way, and she did! Finish on beam with a flourish and the artistry that she can deliver so well. All to secure a very solid commendation and a top half final score in her first National grade. 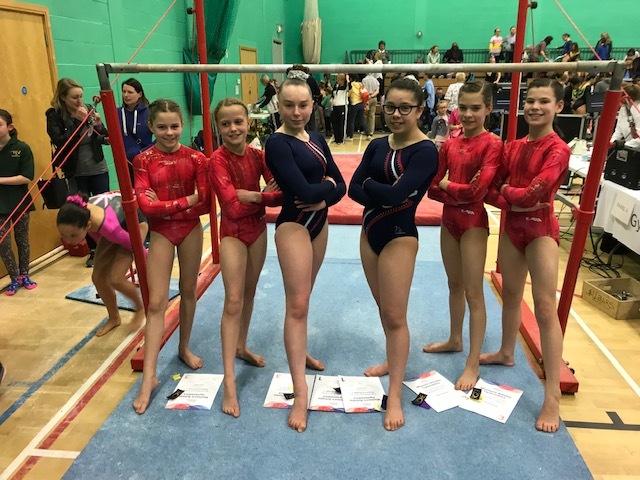 Teamwork was the order of the weekend and Wetherby gymnasts, coaches and parents delivered. For wonderful reasons we were down one of our usual coaching team members, and not any old coach but our head coach. Wetherby gymnasts rose to the occasion. First round, Charlotte, Sophie, Libby C and Emily in Regional 3, Grace and Eleanor in Regional 1. Coaches needed only to supervise, without being asked Grace and Eleanor led a team warm up on floor. Then line up and pieces, all gymnasts stepping up and showing that this was their competition. Supporting their own club, supporting others, ready to move round, ready to meet the judges, ready to perform. Solid floors in hand with 2 top 10 places (Grace – 9th, Libby C – 10th,) the 6 gymnasts headed off to Range. All the hard work paid off. 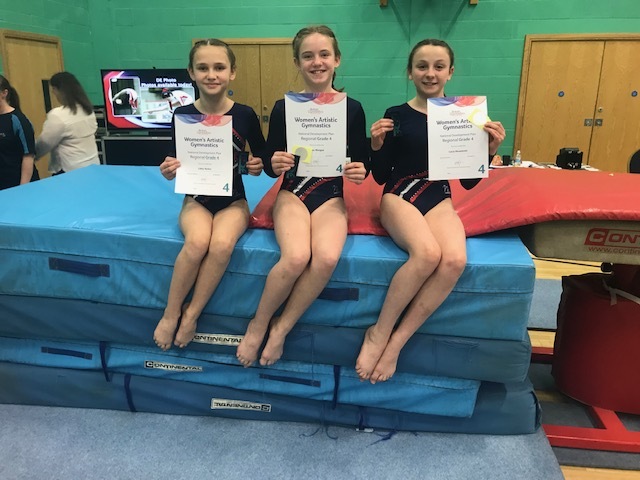 Fantastic range scores including two 1sts (Sophie & Libby C,) two 3rds (Emily & Eleanor) and 7th (Grace) as well as excellent feedback on our held handstands. Vault was next and vault they all did, delivering what they deliver in the gym plus the extra competition polish with Libby C coming 5th on vault with a super 13.067. The four juniors nailed their bars, with Charlotte delivering a whopping 12.733 to come 5th on this piece. Grace performed a very solid consistent routine and secured a resounding 11.300. Both Eleanor and Grace performed their first sole circles in competition. Eleanor unfortunately had a nasty fall on bars. She picked herself up, got back on to finish the routine and still score 10.333. Beam was uplifting. Eleanor, still a bit shaky from bars took a fall, but was determined and focussed and tried not to give the judges opportunity to take any more points. Grace went clean and delivered a secure 6th place on this piece. Charlotte delivered a 7th place, Sophie an 8th and Emily a 9th. 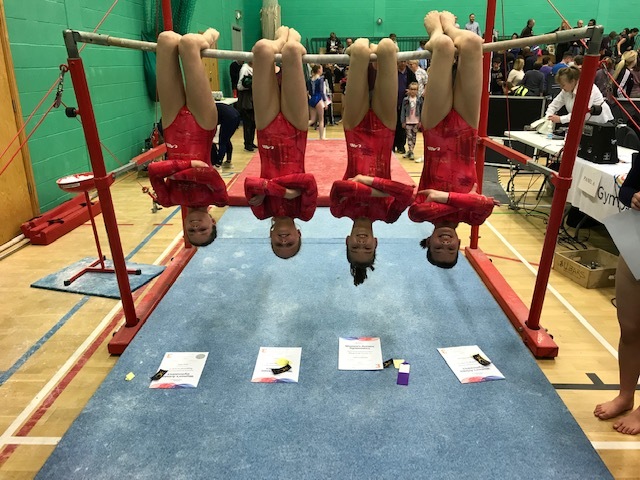 The Wetherby girls meant business on beam and it showed with the extra work in the gym converting into points at the competition. 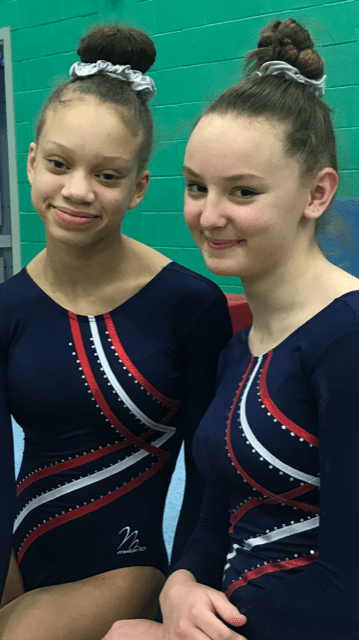 A fantastic attitude from the gymnasts made the coaches job a doddle and secured 3 distinctions (averaging 12 per piece) and 2 commendations (averaging 11 per piece).